Quick service when you need it most! 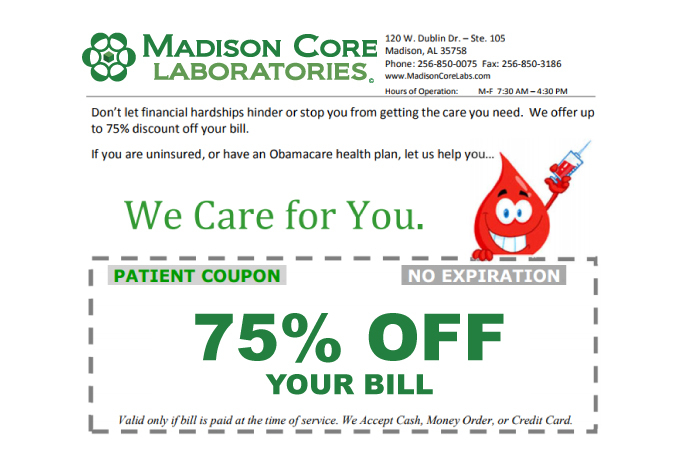 Madison Core Laboratories (MCL) is a state-of-the-art full service locally based independent clinical laboratory. Our clients includes physician offices, long-term care facilities, assisted living facilities, homebound patients, addiction clinics, and industrial/corporate testing needs. MCL is one of the leading independent laboratories in Alabama. We provide extensive laboratory services using state-of-the art testing equipment to provide our clients with the latest innovations in the laboratory spectrum. We provide mobile services, rapid courier pickups, timely, and accurate results. A dedicated account representative is assigned to each specific account. This ensures one point of contact for all your questions and scheduling needs.